You might have read a lot of zwds articles and a few books already, but still don’t have a clear picture when facing some of the charts. You might know some flying star principles already, but still not sure which way to fly in some cases. You might have zero knowledge of zwds at moment and try to find a way to start with. You might know the meaning of single star already, but hard to tell the difference when double stars combined together in certain palaces. 1) The meanings of the all zwds Palaces from people, events and wealth point of view. 2) The difference of Life Si-Hua, Flying Si-Hua, Self-Hua and Self-Hua to opposite palace. 3) The meaning of Si-Hua & its application in all zwds palaces from people, events and wealth point of view. 4) The Flying Stars Concept & 8 Flying Star Principals. 5) The meaning of Double Si-Hua. 6) ZWDS Star Research Methods and the meaning of Single Star, Double Stars and the Star Applications for Marriage, Disease, Objects & Career Planning. 7) ZWDS chart analyze skills with case study. 2. A zwds teacher with great attitude, knowledge, experience and patient to guide you through. 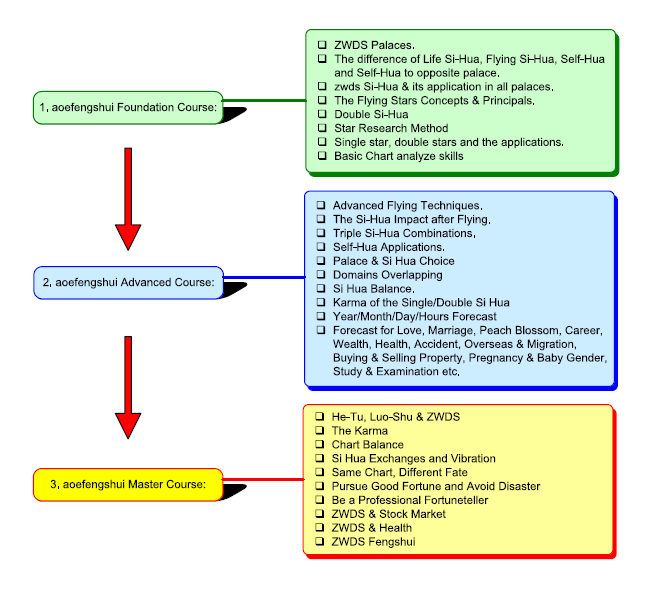 Here comes the aoefengshui “one on one” zwds foundation course with ebook. Why this foundation course is important? How the course will benefit you? How it works? 1. The course is a quickest way to lay a solid foundation of zwds to build upon, because it’s almost impossible for anyone to go through the Advanced and Master’s Course without foundation. 2. The course will streamline and reorganize all your zwds knowledge into a system that works well for any zwds chart reading. 3. The ebook is more than 160 pages in total. You can read online or save it into your computer. There will also be some online references with the ebook for better understanding. 4. You will have the course notes from aoefengshui to address the important issues. It might be just a short note in some cases but it will save you lots of time and efforts for study. You will benefit from many years reading experience of aoefengshui. 5. aoefengshui will spend 30 days with you in a private board at Fivearts to answer all the questions “one on one”. And you will also have extra 7 days for the supplementary questions afterwards. 6. And this foundation course is not only last for 37 days. 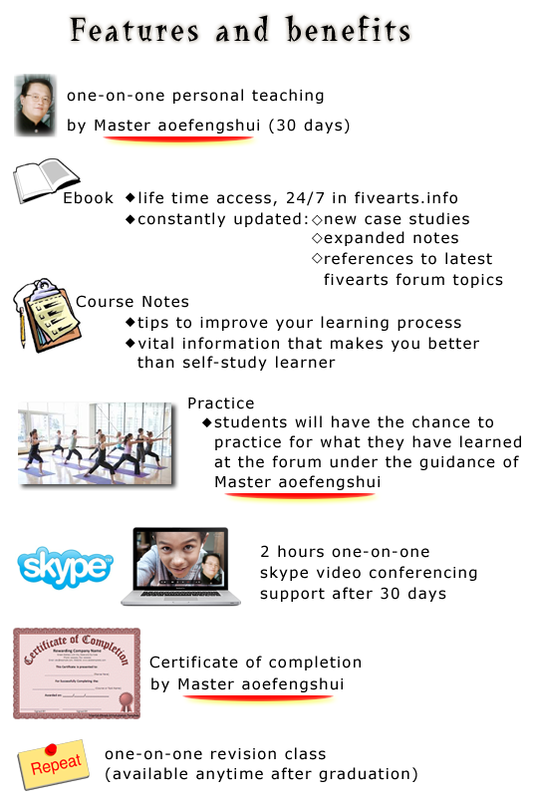 aoefengshui will update the ebook content, course notes, case studies and Q&A, you are able to access them all the time. Congrats to master aoefengshui. Hope the best for your course. Congratulations Aoefengshui! All the best! 生意兴隆! Interested, please do post some more info. Congratulation, aoefengshui. All the best! Thanks @Jakasembung , @ArtofFugue , @ZhouYu , @Kevin Chan , @TianTong , All. And @darkp , detailed info will be ready in 2 days. Thanks @greenapple , @HanSheng . Page created in 0.306 seconds with 63 queries.